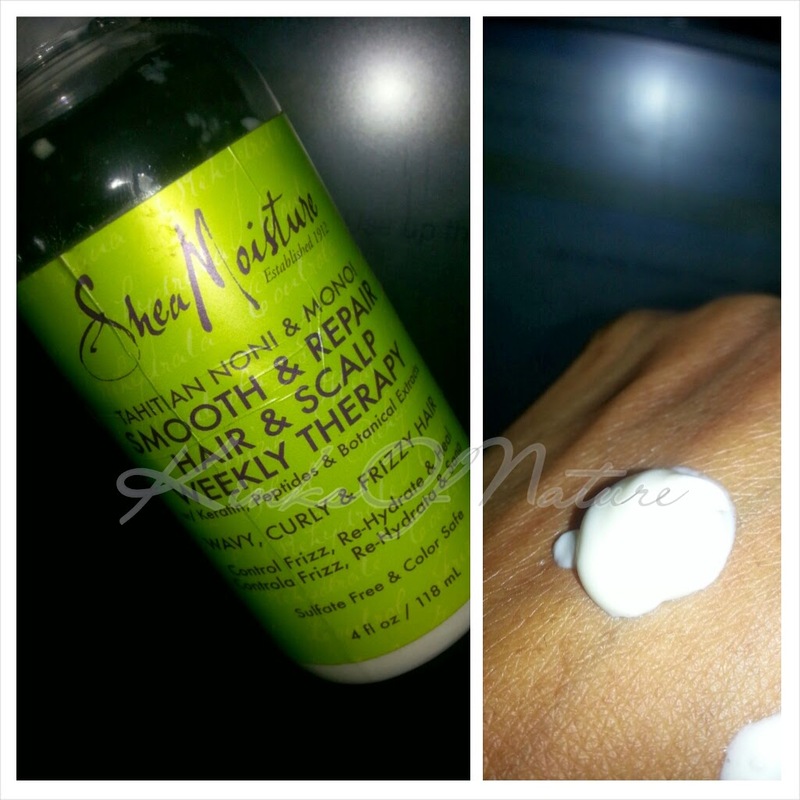 Shea Moisture debuted their Tahitian Noni & Monoi Smooth & Repair line earlier this year. I've tried a couple of the products so far. Here's a review for the Hair & Scalp Weekly Therapy. Product Claims: This ultra-nourishing treatment is the secret to healthy, shiny hair. [Shea Moisture's Tahitian Noni & Monoi Smooth & Repair Hair & Scalp Weekly Therapy] works to soothe, hydrate and provide antioxidant benefits to the scalp, which promote healthy hair renewal and growth. Certified organic Shea Butter, revitalizing Tahitian Nono and Monoi Oil blended with Keratin, Peptides and Botanical Extracts nourish, repair and protect distressed hair fibers. Hair looks thicker and fuller over time. Thoughts: Weekly Therapy has the consistency of a lotion. It's similar to the Shea Moisture milks, but slightly thicker. Each time after using Weekly Therapy, my hair felt strengthened, not moisturized. It's essentially a protein treatment. I've used this treatment 3 times and can probably get a partial use out of what's left. For me, it performed similarly to the ApHogee 2-Step treatment, but without the mess. The treatment can be applied to wet or dry hair. I can use less product when my hair is wet, but I still find that I need a lot to fully coat my hair. I always follow Weekly Therapy with a shampoo and a moisturizing deep conditioner. I can't comment on this as a treatment for the scalp because I avoid applying it there hoping that the fragrance won't linger as much. The smell...it's like ApHogee mixed with an overwhelmingly strong floral fragrance. It does linger even after rinsing and occasionally after shampooing. I don't like the fragrance at all. Shea Moisture Tahitian Noni & Monoi Smooth & Repair Hair & Scalp Weekly Therapy retails for $9.99 (4oz) and is currently available in Target stores. Would I repurchase? Under extreme conditions! If I were out of protein treatments, couldn't get ApHogee or Curl Junkie, and this was on a BOGOF or BOGO50%, then yes. Otherwise, no. The fragrance makes me gag. I can purchase a 4-ounces bottle of ApHogee for half the price or get a bottle of Curl Junkie Repair Me, which is $29 for 12 ounces so the price would be nearly equivalent to that of the Weekly Therapy.